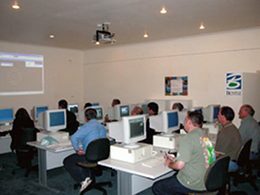 People: CADDIT offers trained staff with years of CAD CAM industry-specific experience. In-house industrial design systems include SolidWorks, Geomagic, CATIA V4, T-Flex CAD CAM, progeCAD, AutoCAD and many others. Contact us using the link above. Resources: Visitors can search our updated knowledge base anytime by typing keywords into the search box at the top of the page. General questions about CADDIT support can be telephoned or posted directly using the "Contact Us" link above. • progeCAD Educational License: progeCAD Professional free in unlimited quantity to schools. progeCAD and AutoCAD Forum • ProgeCAD as default drawing app. Works like AutoCAD ®. Create and edit AutoCAD DWG 2D & 3D files at less than a tenth the cost of AutoCAD. Print PDF, STL & more. 3D Parametric Mechanical Design Software - low cost & easy to use. Optional sheet metal design, KeyShot rendering & simulation. Mathcad offers a unique next-generation WYSIWYG calculation software for scientific research, traceability and visualization.